Berezan's Mine is a closed mine located in northern Deshaan, just west of Mzithumz. 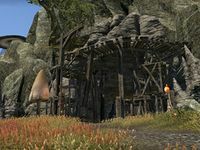 The mine is located next to a waterfall, and is home to a special crafting site, where you may craft items in the Armor of the Seducer set. The mine was recently closed to all visitors by order of the Tribunal. This page was last modified on 19 November 2018, at 05:13.